Wisdom of Life. 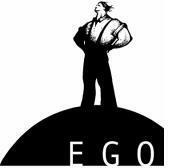 : What is ego......??? Little darling was asking whether egoism is bad! If you refer to some encyclopedia, their definition could be described as... Egoism is an excessive sense of self-importance and to solely act in one &apos;s own interest even if it hurts other people. People describe egoism as being "selfish." My answer to her is Yes and No! An aggressive salesperson who has no high ego, might not challenge himself to be the top sales producer. I believe all successful people have high ego as well. Their inner pride and self esteem which are also considered as their personal ego, gives them their extra energy and force to strive for their goals and achievement. This ethical egoism creates prestigious and glamorous instinct to win all the time. On the other hand if for some reasons, little darling has offended me and not willing to seek for forgiveness. Then I have to say, she is definitely a lady who has a lot of ego and pride, when she refuses to accept her mistakes. Her self importance is playing on her, accepting defeat is rather difficult to admit. As she is a most understanding person, she is always prepared to say the word 'Sorry' when she is at wrong. In fact to say 'Sorry' is a strength and not as most people thought it's a weakness. To say Sorry, one needs to have the courage and less of egoism to do it. Food for thought - "Every man of action has a strong dose of egoism, pride, hardness, and cunning. But all those things will be regarded as high qualities if he can make them the means to achieve great ends" - Giorgos Seferis quotes. It's true. I never know I'm such an egoistic person, till I fall in love. My partner always tell me and I realised, whenever we argue, it will be he who will come and talk to me. Slowly, I let go of this attitude. But, I still have in me. But then, we can't always use the word sorry. As he said, I'm asking sorry just for sake of ending the argument and not meaning it for real. Any words from the mind alone might not be sincere. Words from the mind and the heart are purer. Your abang is a wise man who could see the different. So speak with the heart all the time my dear. My next posting tomorrow is related to this issue. Please read and give your comment.